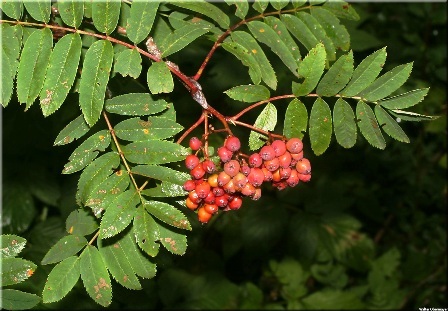 Other names: Ashberry, European mountain ash. Rowan is a fruit from Europe. Different views are held by botanists about its origin. Some opine that this fruit it is a native of Britain and Ireland. Others think that it originated in Europe, Asia Minor or North Africa. But basically it is considered an European fruit and under cultivation in various parts of Europe since ages. It is being grown in Britain sine very long. Here, it also has several interesting myths associated with it. One is that it can ward off the witchcraft done by mischievous people. A hardy deciduous tree growing upto18 m; bark grayish brown, smooth, shiny when wet, with dark raised dots or lenticels, scattered across; branches typically upward-pointing and terminating in ovoid, purplish buds, which are often covered with grey hairs. A rowan tree can live to over a hundred years. Terminal buds, woolly, 13 mm long, lateral buds have several scales. Fruit 6-7 mm wide, yellow to red, borne in showy clusters. Seeds small, upto 8 but 2 in most fruits. The fruits are not eaten raw because of their bitter taste. However, these are made into a slightly bitter jelly which in Britain is traditionally eaten as an accompaniment to game. The fruits are also made into jams and other preserves, on their own, or with other fruits. 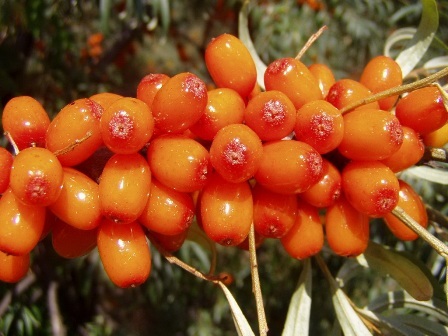 Rowan fruits are an excellent source of vitamin C.
The berries can also be a substitute for coffee beans, and have many uses in alcoholic beverages: to flavor liqueurs and cordials, to produce country wine, and to flavor ale. Try squeezing some of the fresh berry juice and putting it into a gin and tonic – it makes a convincing alternative to ale. 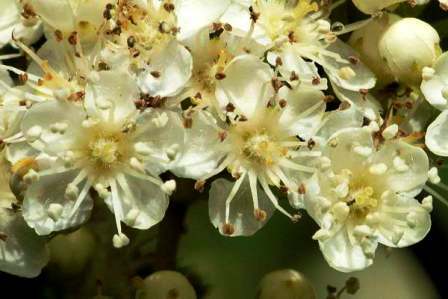 The hard pale brown wood of the rowan was used to make bows in the middle ages, also used for tool handles, bowls and plates and for general woodcraft. 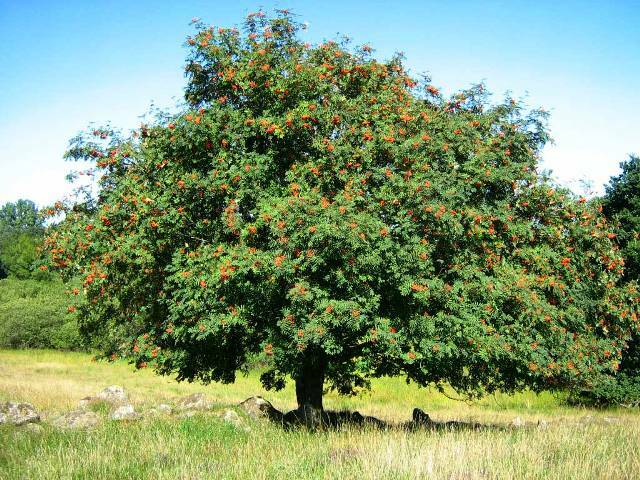 Rowan tree is also believed to have several magical properties. It was therefore used for several for warding off evil spirits and bad luck in UK and many other European countries. As rowan bears very attractive flowers and fruits, so it is a very good plant for planting in parks, gardens and alongside roads. Long avenues of the tree make a pleasant sight as it is naturally narrow in shape and thus does not occupy much space. In addition, the delicate foliage of this tree allows plenty of light through for grass to grow underneath it. Rowan is a tree of temperate climate. It grows best on light, peaty soils with good drainage which are not too dry. It likes open unshaded areas with plenty of sunshine but not too hot. New plants are raised from seed which germinate readily.